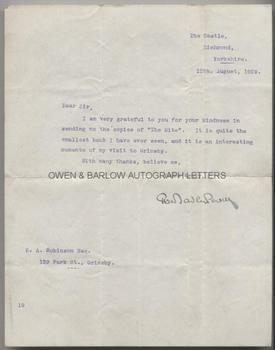 LT-GENERAL ROBERT BADEN-POWELL Typed Letter Signed. British soldier and founder of the Boy Scout movement. TLS. 1p. The Castle, Richmond, Yorkshire. 13th August 1909. To E[rnest] A. Robinson. "I am grateful to you for your kindness in sending me the copies of "The Mite". It is quite the smallest book I have ever seen, and it is an interesting momento of my visit to Grimsby." With a nice, clear autograph SIGNATURE. 4to. Approx 10 x 7.75 inches. Slight creases. The downstroke of the last character of the autograph signature is slightly smudged, probably by Baden-Powell himself when using blotting paper but is a good, bold example. Fine. Ernest A. Robinson was a railway worker from Grimsby. He was a miniature book enthusiast and amateur printer who in 1891 produced what was then the smallest book ever printed from moveable type and remains the smallest ever produced in Britiain. He often made presentations of his book to visiting dignatories to Grimsby. It seems from the letter that Baden-Powell had visited Grimsby in 1909 (possibly in connection with the formation of a Scout troop, which much occupied his time around this date) and Robinson had sent copies of his book to Baden-Powell subsequently. N.B. We have Robinson's own copy of "The Mite", together with the original type and printing blocks for its 3 editions and a collection of ephemera relating to it (including letters confirming its acceptance by Lutyens' Committee for the Queen's Dolls' House, etc) and will be pleased to respond to enquiries regarding these additional items.